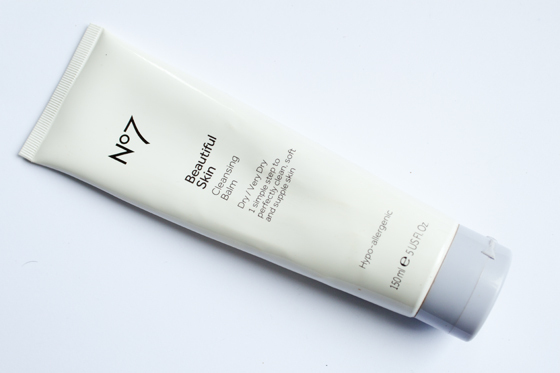 No7 Beautiful Skin Cleansing Balm is part of the No7 Beautiful Skin range which has a variety of skincare products tailored for different skin types. The one I use is actually formulated for dry or very dry skin. My skin is neither of those, it's actually combination/oily. However out of the two Beautiful Skin r cleansers I'd tried, I found this to be the one that worked best for my skin. The Foaming cleanser which is supposed to be formulated for Oily/Combo skin didn't really work for me formula wise as I prefer my cleansers to be much thicker. It is a good product though so I might review it soon. The consistency reminds me of a thick moisturiser, it's a very heavy rich cream. I personally wouldn't say this product is a "balm" it is definitely more of a cream cleanser. The No 7. Cleansing Balm has no noticeable smell and I use this as a pre-cleanser. The Cleansing Balm is very gentle on the skin and doesn't make the face feel tight or dry. I have used this all over my face including my eyes, but I prefer taking my eye makeup off before I cleanse my face and it works well at breaking down makeup. I tend to take off the "first layer" of makeup with a makeup wipe and use Bioderma, and then move onto this. I spread it all over my face, leave for about 30 seconds and then use a muslin cloth to wipe off any excess makeup that the wipe hasn't taken off, I then wash my face with Origins Zero Oil Face Wash. It might be excessive to use a wipe and a cleanser then wash my face but I really like to make sure every scrap of makeup is removed before going to bed! I bought this when there was one of the £5 off No7 vouchers going around a few months ago so I literally only paid a few pounds for it. The offer is on at the moment so it might be worth trying out! I wouldn't say this is the best makeup remover I've ever used, I do like Liz Earle Cleanse and Polish but this is what Im currently using and I am satisfied that it is doing its job! Skincare Disclaimer: I personally think skincare is incredibly subjective, I'd never run out and buy something on the recommendation of one person. What works for me, might not work for you. I personally don't feel comfortable recommending skincare products, so all reviews are based on my own experiences with the product mentioned. Remember to always look up other reviews and make sure you reference the reviewers skin type. My skin is Oily-Combination, I don't tend to get breakouts but when I do they are on my chin. Also cutting out dairy from my diet has also improved my skin of late. I want to try out some of the no7 skin care range, I need to get a £5 off voucher! looks like a great thing to try!